Today's date marks a special day in my life. 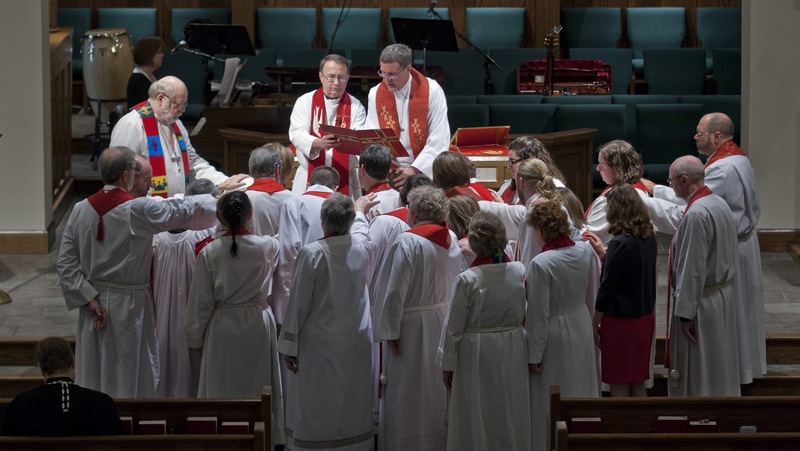 Two years ago I was ordained a pastor in the Evangelical Lutheran Church in America. Two years ago we gathered as a community from all across the US and even Iceland. We gathered to worship, pray, and give thanks to a God who calls each of us beloved. To praise the One who calls us to a life of service. Folks gathered who knew me since I was young, folks who taught me the truth of being a pastor, folks who loved me when I didn't know what love really looked like, and folks who knew me as just Kim without that title pastor in front. The day brought joy and tears. Hope and fear. Incredible awe and incredible trepidation. Yet, I was not alone. As in the past, my inspiration came from the woman at the well. For two years living in Africa I felt like the woman at the well. I lived for some time as a stranger, a foreigner. The well became my refuge, a place to reach out for living water. I learned from a nameless woman. This woman at the well who taught me to constantly search for the living water found in community at the well and in the waters of Christ's love. Who taught me to laugh with no restraints. Who taught me to never take easy answers. So of course I needed to hear from that same woman at the well as I embarked on a call taking me states away from family and friends to a place where I would be known as pastor. I needed to know that no matter the challenge or adventure, I would be met by the One who offers life. And as in the past, the woman at the well became my confidant and partner as I yearned for living, life-giving water. She walks with me as I maneuver this vocation known as pastor. When I gather around the hospital bed hearing the prayers of one who yearns for peace in his heart and the next day rejoice with him at the doctor's words, the woman at the well beckons, "Come and see." When I watch the spirited two-year old walk laps around the pews during the Eucharistic prayer and come running to the front for the children's time, the woman at the well says, "Come and see." When I listen to the struggles and questions of one desiring to know that grace is real, the woman at the well speaks, "Come and see." When I mark the sign of the cross on the forehead of children, the woman at the well says, "Come and see." When only death and loss fill the reality of a grieving spouse, the woman at the wells says, "Come and see." When the confirmation students exhilarate me with their questions of God, the Bible, and life, the woman at the well says, "Come and see." She continues to force me to look deeper in all my relationships and to see the life found in being with others. She continues to remind me to share with reckless abandon the living waters that come through God's word, bread and wine, and gifts of community. I'm not done with this woman at the well just as she will never be done touching my life. So for the last two years and for the hope of a promised future, I say along with the woman at the well, "give me this water, so that I may never be thirsty or have to keep coming here to draw water." I too have found the One who knows me and tells the truth, the truth of life-giving water found in the Body of Christ. There are some days that I just sit back and pinch myself in an effort to believe that my calling can be so much fun. 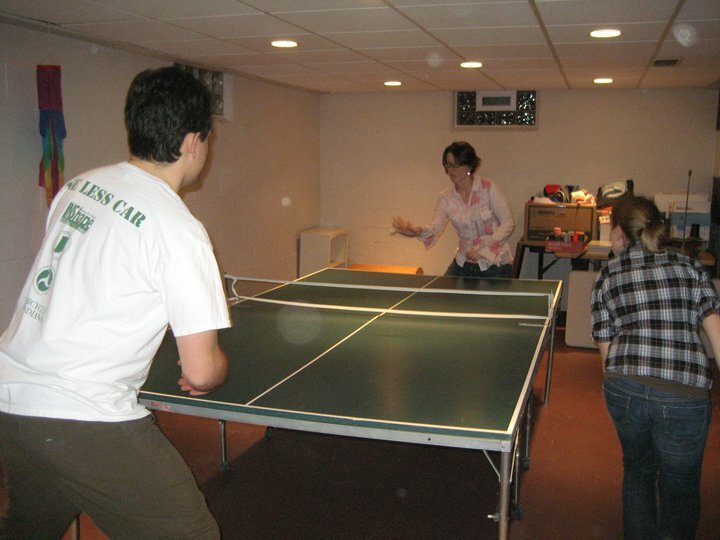 Yes, fun as in laugh-out-loud, running around a ping pong table, out-of-breath fun. The kind of fun that relishes in do-overs. The kind of fun that includes all people and all gifts. The kind of fun that brings laughter together. The kind of fun that breaks down barriers of ages and beliefs and differences. The kind of fun that would bring Jesus to join us around a ping pong table. ping pong table, ping pong ball, and at least 3 people (you don't even need paddles, just your hands). I first came to know about KONG while in seminary thanks to my friends who hung out at the Ohio State Campus Ministry. The game was too good to keep to themselves. And since then the game of KONG has been present during lunch breaks, New Year's Eve celebrations, evening study breaks, and everything in between. You basically hit the ping pong ball and then run around the table to the other side so you can hit the ball back over again. Over and over again. Making sure the ball bounces on your side first before heading over the net. Imagine the fun in gathering with seminary students of all ages and your professors to run around the ping pong table hoping not to get out. Imagine the fun in ringing in the new year with friends new and old and learning about your strengths and weaknesses as you keep your eye on the ball. Imagine the fun in seeing everyone take part and everyone having a gift to share. This fun was brought to Missouri at a dinner party with three different families present and ages ranging from 15 - 50. Pastors and pastor's spouses, construction workers, business owners, high school administrators, and students were all part of the fun. And of course there was laughter. And there was learning about each other and our strengths. And lots of do-overs. Glimpses of the kingdom of God. She's big. And blue. And quite beautiful in that worn-out-give-me-attention kind of a way. But she's ours. All 3,870 pounds of her. Stephen, my husband, and I own a 1972 Chevy Suburban. A three-door truck, utility vehicle they call it, large enough to fit the entire youth group I believe. She came under our possession after the closing bid of an EBay auction - only $25 over the reserve price. Luck had it that she was up for auction three other times and never sold before Stephen placed his bid. Luck had it that the owner only lived 3 and a half hours away in Kansas. Luck had it that we have friends who own a car trailer so we could haul her back to Missouri. Yet, I knew luck had nothing to do with owning a '72 Chevy Suburban. My father owned another Chevy car from 1972 and with just a little over one year since he died, my husband and I are honored to restore and work and play and enjoy a car that we know he would have loved to be working by its side. Luck had nothing to do with it; we know we have angels looking out for us. And thankfully, we were not alone as we drove three and a half hours to the middle-of-nowhere Kansas to pick up the Suburban. Randolph, Kansas. I've driven in Kansas before and was glad that Stephen could experience the state's expansiveness and distinct beauty through the Flint Hills. Mile after mile along I-70 to our destination looking out over the hills and the blue sky we wondered what exactly we had gotten ourselves into. We only saw pictures of the car. We only read that it ran. We only engaged in short phone conversations detailing our pick up time. Who knew what we had invested in. After driving through the nearest large town, Manhattan, we went north 20 miles till we reached Randolph. Perhaps we'd be able to get a bite to eat after loading the car, so we thought. We called the sellers once we arrived unsure of our destination and parked outside of the abandoned Fleetwood Grille. Only a gas station across the way drew any sort of notice in this stretch of town. Even before we got a glimpse of our big, blue beauty we could hear her roar. Stephen and I turned at the same time and exclaimed, "There she is!" Our EBay seller got out of the car with a smile on his face and the title in his hand. Stephen checked it all out, opened the hood, sat in the driver's seat. She was ours. I mentioned we had a car trailer, but Stephen had just picked it up the day before to get himself familiar with its workings. Our new friend from Kansas even noted that you don't see trailers like that around here too often. But Stephen rolled back the rollback trailer so the car could drive on and drove the car on. Step one. The difficulty came when our trailer needed to be rolled forward, but it just wouldn't go. Slight problem. She was ours. With only three and a half hours of driving to separate us from being home. Our Kansan friend said to us as we prepared to leave, "Just promise each other that you'll finish one project before starting another." Throughout the drive home both Stephen and I kept looking back at our big, blue beauty. And we kept driving to a future full of more unexpected journeys and hospitality along every turn. Today we celebrated the Baptism of our Lord. As a Sunday school we shared our baptismal items: gowns, candles, certificates, bulletins, stories, and memories. The body of Christ called to live out our callings as God's beloved. We took time to celebrate our neighbors at the elementary school next door and shared our thanks for their work with the youth. We talked about full names and when they get used, what our names mean, and how God gives us a new name that cannot and will not ever be taken away from us. We were drenched in the love of a God who knows each of us intimately and deeply. 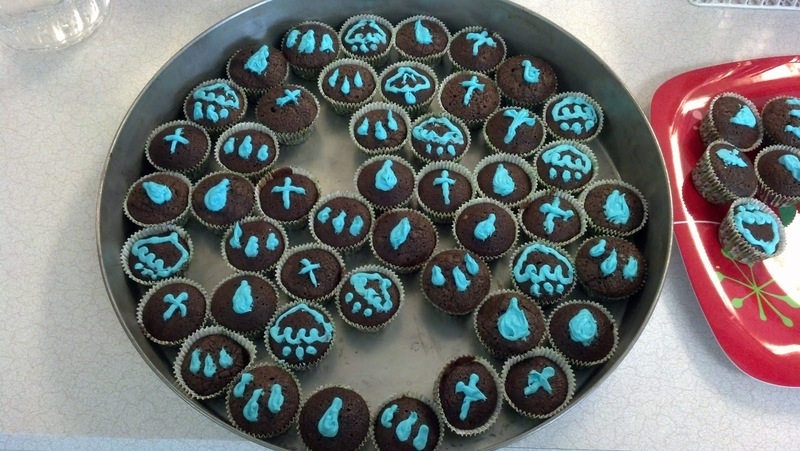 We even ate baptismal themed snacks - blue jello cups and brownies with baptismal symbols. Drenched in the goodness. The reminders of God's call surrounded us. During worship we spoke the words of the Thanksgiving for Baptism, sang all those hymns that bring tears to your eyes, and gathered at the font. One by one, the beloved children of God came forward. My husband, Stephen, and I welcomed the congregation to the font. What a privilege to look into their eyes, to see them for a moment as God sees them, and to touch their foreheads with water. Each person came forward for the blessing. And with each dipping of my hand into the water, I too was blessed, and drenched. Drenched with water and the love of a community. Drenched in the reminder of mercy and forgiveness. Drenched with story after story of God's love for all people. Drenched with the hope of peace. Drenched in God's kingdom here on earth. The congregation had all come forward and the music continued. Stephen and I were still up front and he turned towards me. "Oh yes, I always forget about receiving the blessing myself." "Child of God, remember you are sealed by the Holy Spirit and marked with the cross of Christ forever." In that moment I was no longer pastor and he was no longer seminarian. In that moment all that mattered was the water and the word. God's word and God's abundant grace overflowing into our lives. It was just a moment and it was fleeting, but it was real and incarnate and brought the kingdom of God to earth. I mean really love peanut butter? As in a love that declares that peanut butter on just about anything makes the meal that much more delicious? I've loved peanut butter for as long as I can remember. Except for that brief time in elementary school where I threw up after eating a peanut butter and jelly sandwich. Who knows what caused that momentary lapse in health but I was sure it had something to do with the peanut butter. I swore off those type of sandwiches for years and wouldn't come close to anything related to peanut butter or jelly for some time. Luckily, I eventually tried a peanut butter and jelly sandwich again which didn't result in anything remotely disgusting and the love affair was restored. I was back in love with peanut butter. Peanut butter and I had a deep relationship while I lived in The Gambia for two years. Ground nuts as the Gambians called them were grown by everyone. When you grow ground nuts to help support your family you use them in everything. Ground nuts in a variety of forms were a staple for all three meals of the day. Peanut sauces came in varying degrees of hotness, thickness, and consistency. As Peace Corps volunteers we all compared which host mother made the best peanut sauce recipe. One of my highlights of helping the women cook was roasting the ground nuts and preparing them to be ground for peanut butter. Everything takes more time in Africa. There is no such thing as grabbing a can of peanut butter off the shelf. After all the farming and harvesting and collecting and sorting of the ground nuts, they must be picked through and roasted over an open fire in a large cast iron pot. Mixed with a large spoon, roasting the ground nuts is a work out in and of itself. Ever taste a hot, freshly roasted nut? Just do it. Once the ground nuts are roasted comes the work of grinding by hand. Again, hot freshly ground peanut butter. Just try it. I would volunteer as often as possible to help the women with the peanut butter. Little did they know (or at least they never let on to my secret) how much peanut butter and freshly roasted nuts I would consume in the process. You may ask why this love note to peanut butter? Perhaps because in every bite of peanut butter I take now I am transported to a time where I felt deeply and intimately connected to the land and to the people of The Gambia. Perhaps because with the smell of freshly roasted ground nuts I give thanks for the hands of the women who taught me the meaning of working hard and playing even harder. Perhaps because the world needs all the goodness it can take. I can't pinpoint when the love began. Perhaps it even began in the womb since my parents were both lovers of musicals. I only remember that musical theatre has been a part of my life from as far back as I can remember. Community theatre. Musicals on VHS and DVD. Listening to soundtracks on car rides. And of course my first NYC Broadway musical. Titanic the Musical. Yes, even with knowing the ending, the musical drew me in from the first note of the orchestra. I first learned of Titanic the Musical from the Rosie O'Donnell show where I saw the cast sing their opening number. I knew all the words to the music well before making our way to New York City. As my mom and I sat in the theatre to see Titanic, I remember holding back tears as the orchestra began. At this point I wasn't crying over the fate of the Titanic's passengers but rather tears of joy and awe at the beauty and magic of live theatre. Live musical theatre. As many musicals as I have seen since, Titanic holds a special place in my heart. My mom and I even figured out that her first Broadway musical was seen in the same theatre as we saw Titanic. (Of course my husband doesn't know this yet but we'll be taking our children to that same theatre for their first Broadway musical). I'll see any musical and when friends organized to see The Book of Mormon I immediately said, "Yes!" We had the tickets for 10 months before the show thanks to its amazing popularity in Chicago. The day of the show from beginning to end was perfect. Perfect in the sort of way where you feel completely at home and completely known by friends. Perfect in a pinch-yourself-this-can't-be-that-good kind of a day. Perfect as only perfect can be when you are surrounded by imperfect people who know just how imperfect you are too. The group at the show consisted of college and seminary friends and the partners we've acquired along the way. Some of us go back 12 years and have plenty of stories and laughs to share. Living in a new town and a new state venturing into this world of pastor can be lonely at times. It takes time to build relationships and the Book of Mormon day was just the needed reminder that I am known and loved. And that friendship transcends time and place. After the show one of our friends arranged with his high school friend who just happened to be in the cast a back stage tour for our group. So just imagine the excitement for this musical-loving gal. Pure joy. As I said, it was a perfect day. Not only did I take part in one of my favorite activities with a live show, but I was surrounded by people who have weathered the darkness with me and accompanied me through the years of discernment, doubt, fear, and joy. I will take the opportunity to see a musical any day, but more importantly, I'll also take the chance to experience the awe and magic of deep friendship. Of being known. Of love.